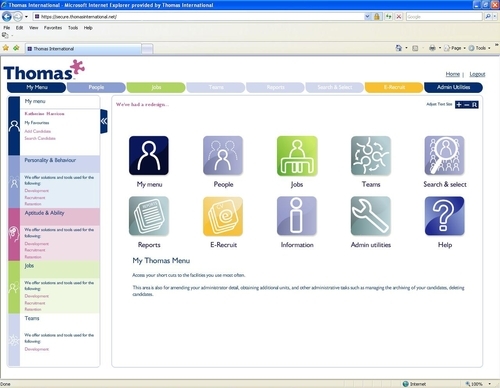 Thomas International, the online assessment experts have launched a brand new website using advanced user interface application Adobe FLEX, which radically improves the delivery of their online tests and assessments. Created in response to client feedback, the new site is more intuitive, easier to use, and meets growing market demand for innovative online assessment solutions. The new site will be officially unveiled at the CIPD Annual Conference and Exhibition in Harrogate on 16-18th September 2008. Visitors to the Thomas stand (B72) can view the new site and will have the opportunity to complete a free behavioral assessment. For more than 25 years Thomas International has been a global provider of objective management systems and assessment tools that help businesses solve their people puzzles. Thomas’ systems enable organisations to understand, realise and develop the full potential of their staff with tools that raise people’s self awareness, self-esteem and self-confidence. Our assessments and tests analyse people’s behavioural style at work, identify their strengths and limitations and help measure their mental agility. Thomas carries out over one million assessments every year. With a presence in over 60 countries, our behavioural assessments are available in 56 different languages. This press release was distributed by ResponseSource Press Release Wire on behalf of Leapfrogg in the following categories: Education & Human Resources, for more information visit https://pressreleasewire.responsesource.com/about.